Tyson Promotions, Inc. has offices in Cabo San Lucas, Baja California Sur, Mexico and San Diego, California, USA. 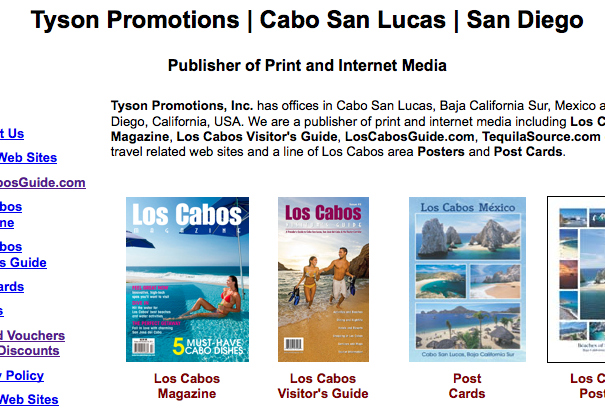 Tyson Promotions is the publisher of print and internet media including Los Cabos Magazine, Los Cabos Visitor’s Guide, www.loscabosguide.com, other travel related web sites and a line of Los Cabos area Posters and Post Cards. We also produce and sell Photo CD Collections of the Los Cabos area, Stock Digital Photography and Royalty Free Images both film based and high-resolution digital formats. Tyson Promotions administers the Prepaid Voucher program for discounts at restaurants, some stores and for select activities. Los Cabos Magazine has been providing comprehensive information for Los Cabos travelers since 1993 and includes editorial material about Cabo San Lucas, San Jose del Cabo and the Los Cabos area of Baja California Sur, Mexico. The digital edition of Los Cabos Magazine is now available online. Los Cabos Visitor’s Guide is produced annually for local distribution throughout the Los Cabos area with guide listings for activities, diving, fishing, golf, hotels, nightlife, real estate, restaurants, services and shopping and more. The digital edition of Los Cabos Visitor’s Guide is now available for online viewing. 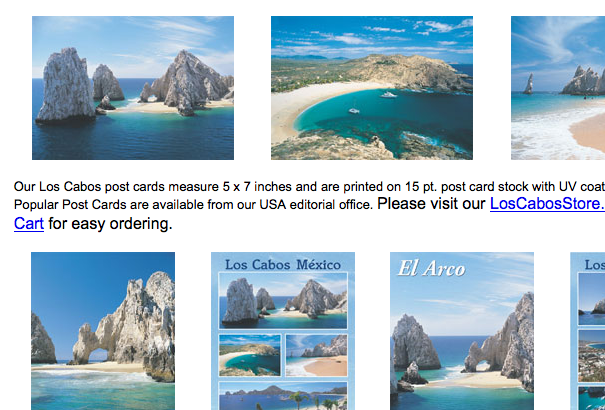 Tyson Promotions produces a full line of post cards with unique scenic images of Cabo San Lucas, San Jose del Cabo and other points of interest in the Los Cabos, Mexico area. Our line of posters features scenes of Cabo San Lucas and Los Cabos include “El Arco de Cabo San Lucas”, “Land’s End Cabo San Lucas”, “Beaches of Los Cabos” and “Hooked on Cabo”. Tyson Promotions publishes a variety of web sites for other areas of interest. Visit the Tyson Promotions website for more information.